Microsoft’s feather-light Arc Touch Bluetooth Mouse is not your average pointing device. 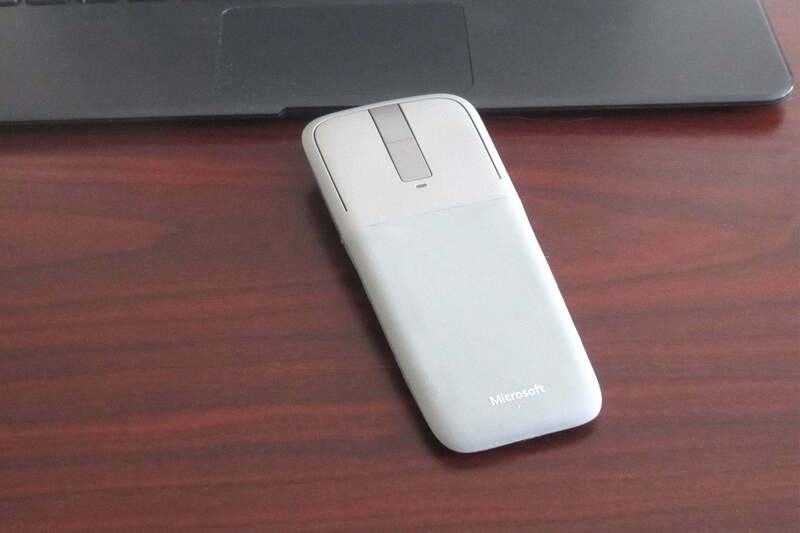 The Microsoft Arc Touch Bluetooth Mouse is stylish, ultra-light, and functional. While there are plenty of innovative wireless pointing devices available, few are as light, compact, interesting, and mobile as Microsoft’s Arch Touch Bluetooth Mouse. It’s designed primarily as an accessory for the company’s Surface Book PCs (it’s the same light-gray color), but since it’s a standard pointing device, it also works with most laptops or tablets running a recent version of Windows (and some MacBooks) that support Bluetooth. The Arc Touch mouse is, when turned off, ultra-thin, making it easy to slip in to your pocket or some other tight spot. The Arc Touch mouse is unique in design. Even so, just about any other small wireless “travel” pointing device, such as Logitech’s M535 Bluetooth Mouse ($39.99) or Microsoft’s own Microsoft Wireless Mobile Mouse 3500 ($29.99), is a direct competitor. You can pick up the Arc Touch mouse for about $40, which is a bit high for a small mouse like this, especially considering that you can buy the EasyGlide Wireless 3-button Travel Mouse, and several others, for as little as $20. That said, you’ll have trouble finding a mobile mouse as easy to carry around with you than the slim and petite Arc Touch Bluetooth Mouse, and like most Microsoft peripherals, it’s well-built, durable, and somewhat elegant. 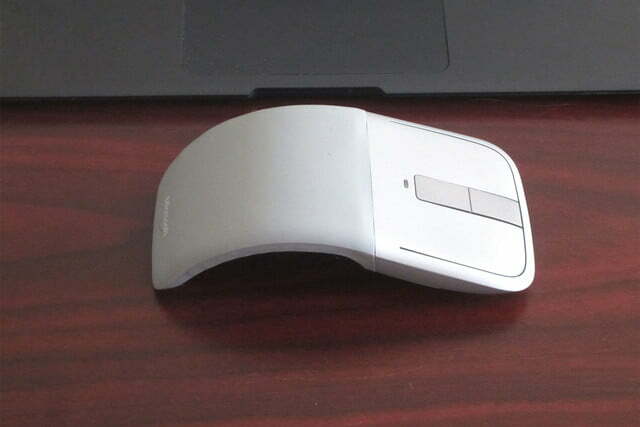 At 0.6 inches high (when turned off) by 2.3 inches across by 5.1 inches long (also when turned off) and weighing only 2.3 ounces, the Arc Touch mouse, while not in operation, is much shorter in height, but longer than most other mice—until you turn it on, that is. You power it up by curling, or arcing (hence the word arc in the name), the tail end of the device downward, thereby shortening its length and increasing its height. But arcing the mouse isn’t merely a unique way of turning the device on. 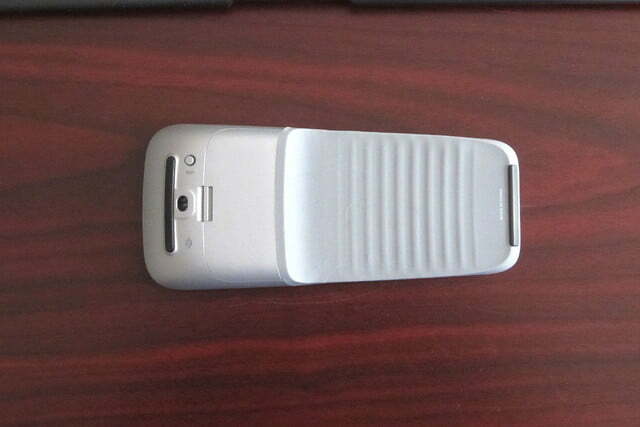 When arced, it fits the curvature of your palm and fingers, similar to any standard small travel mouse. The arc increases the height to just over two inches and shortens the length by about an inch or so, which brings its dimensions more in line with competing products. Logitech’s M535 Bluetooth Mouse, for instance, measures 2.4 inches high and just under 4 inches long; although, at 2.9 ounces, it outweighs the Arc Touch mouse by more than half an ounce. 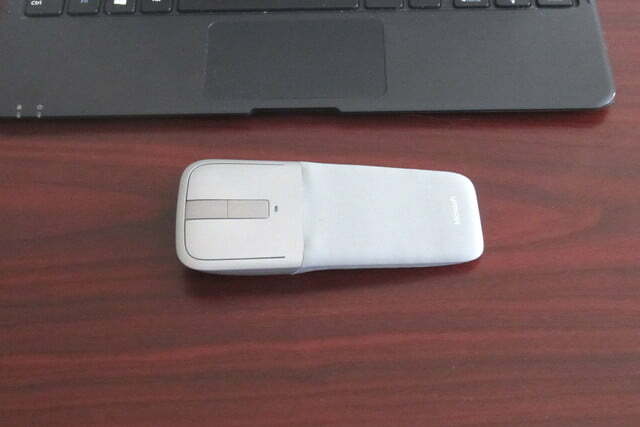 Up front, where the controls are located, the Arc Touch mouse is encased in hard gray plastic, and the back end, the part that arcs, is coated with a slightly darker gray rubber-like material. The controls consist of left and right buttons separated by a plastic strip that acts like a depressible scroll wheel, and, as with most mice, you can change the behavior of the buttons and wheel, as well as alter the scroll speed, pointer, and so on, from an app you can download from Windows Store. While the mouse itself will pair with MacOS 10.10 or higher, alas, there is no such app for Macs. It will not work with any Android device. As mentioned, you bend the Arc Touch mouse to turn it on. A small blue status LED on the underside indicates when its running and ready to pair. 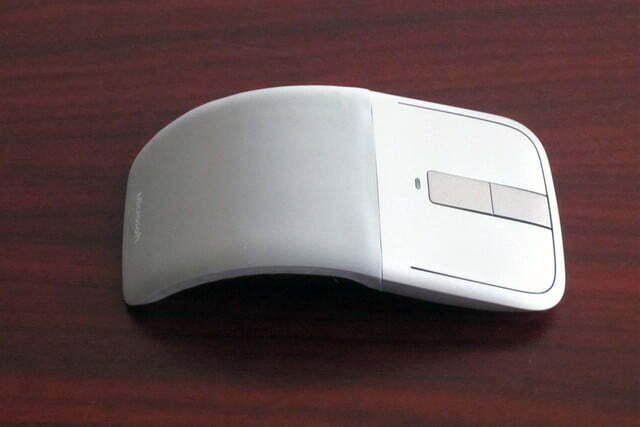 The Arc Touch mouse is light, small, and when turned off, ultra-thin. You pair it as you would most Bluetooth pointing devices, by pressing and holding a small button (also on the underside) for a few seconds to make it discoverable. It paired with both our Windows tablet and MacBook immediately, without any fuss. Many competing mice, including the Logitech M535 Bluetooth Mouse, come with (often proprietary) Bluetooth dongles that enable use on machines without Bluetooth built-in. With the Arc Touch mouse, your computing device must already have Bluetooth available. The advantage is that if your mobile device has Bluetooth, you won’t have to use a valuable USB port. 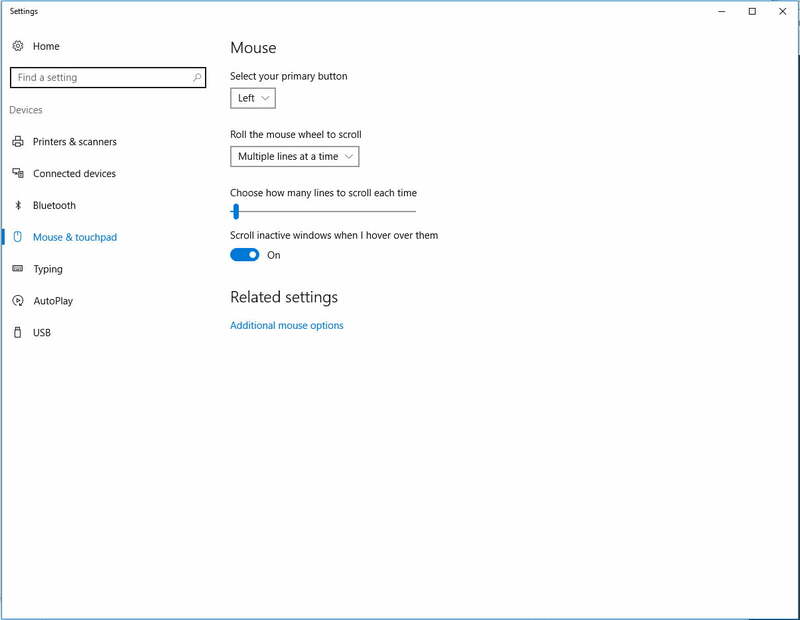 If, on the other hand, your laptop, tablet, or smartphone doesn’t support Bluetooth, you won’t be able to pair the mouse. While we found the Arc Touch mouse comfortable enough, it’s not quite the same as holding a standard mouse with finger contours on each side and a raised scroll wheel. In other words, it takes a little getting used to. It was easier to move around, and to press and hold buttons, when we used it on a bare desktop, rather than a soft mouse pad. That’s because due to the arc, the Arc Touch mouse touches ground in only two spots. When holding a button down, the pressure dug into the mouse pad, making mouse movement a bit difficult. As mentioned, you can reconfigure the buttons and other behavior from the downloadable app. The app gives you extensive control over the center “touch strip” used for scrolling. You can assign a behavior for when you tap it, such as “Browser back” or “Start menu,” as well as turn on audible and vibrating feedback when scrolling. Using the tap function was difficult to master. Despite its odd appearance and unorthodox configuration, though, after spending a little time with it, we found the Arc Touch mouse comfortable and efficient to use. 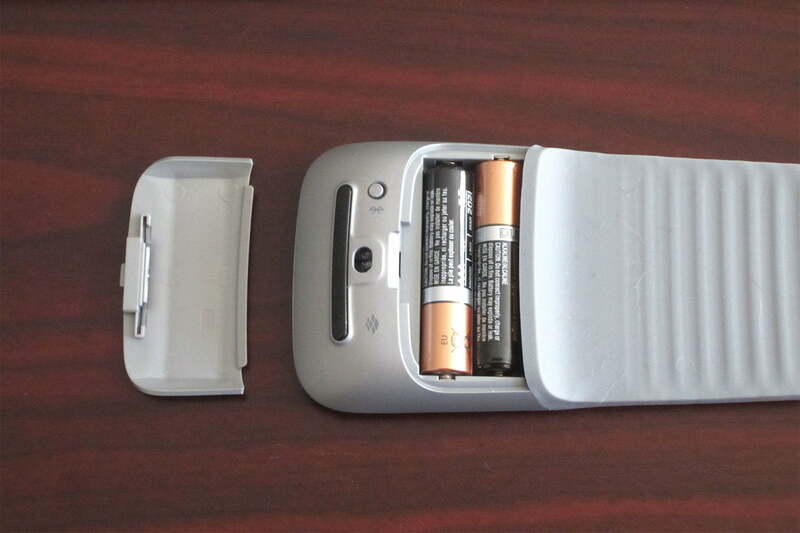 The Arc Touch mouse is powered by two (included) AAA batteries housed in a compartment on the underside of the non-arcing portion of the device. Microsoft says that with regular use you should get about six months from a set of batteries. To turn the mouse on, it must be fully arced, making it difficult to accidently activate in your backpack or pocket. 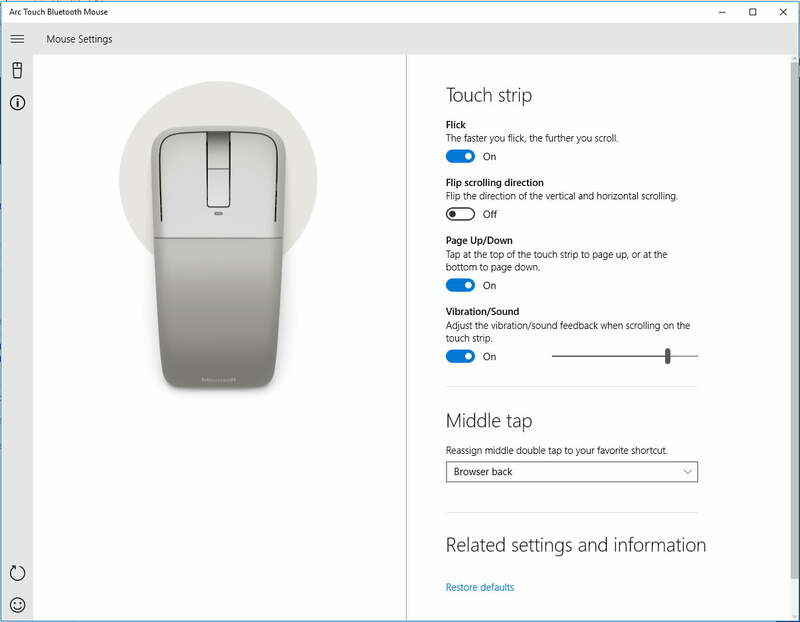 Microsoft offers a three-year limited warranty that provides for replacement of the Arc Touch Bluetooth Mouse if it fails under normal use. Microsoft’s Arc Touch Bluetooth Mouse is light, compact, and stylish, and when powered down (un-arced), it can slip neatly into your pocket. It’s reasonably comfortable to use for so small of a device, and the company’s three-year warranty allows you to buy it with peace of mind. Most travel mice, including Logitech’s M535 Bluetooth Mouse or Microsoft’s Wireless Mobile Mouse 3500, are small and light, but few are as light and compact as the Arc Touch mouse, especially in its flat, or turned off, position. While the Arc doesn’t have many rivals in terms of size, Logitech’s MX Anywhere 2 is competitive in terms of features, and remains our go-to recommendation. The Arc Touch Mouse feels a lot more durable than it looks. It would take some real effort to break it, and the flex (arc) on/off mechanism seem sturdy enough. And if it stops working in the first three years, Microsoft will replace it. Three years of use is a good value from a $40 peripheral. Only if you’re a traveler. If you don’t like using a touch pad or poking a tablet screen with your finger, and you need something light and easy to carry around, the Arc Touch Bluetooth Mouse should serve you well. It’s easy to pair, to use, and you don’t have to take up a valuable USB port. However, should you prefer a standard palm-shaped mouse with a more tactile scroll wheel, there are plenty to choose from. The Arc is meant for people who need to lighten their load, and works well there, but it’s not the best choice for general use.